Before I got into this whole blogger scene, my number one resource for discovering new authors and titles was the Science Fiction Book Club—which has been frequently mentioned—and one of the many gems that was uncovered for me was Matthew Hughes’ “Black Brillion” (2004). While I immensely enjoyed the novel, I actually didn’t think about the author again until I had started Fantasy Book Critic and learned of the two books Mr. Hughes had coming out this year—“The Spiral Labyrinth" (September 2007-Night Shade Books) and “The Commons” (October 2007-Robert J. Sawyer Books). Then, because of the September 2007 Spotlight, Matt contacted me personally and not only hooked me up with his novel “Majestrum” (2006), but also an autographed copy! 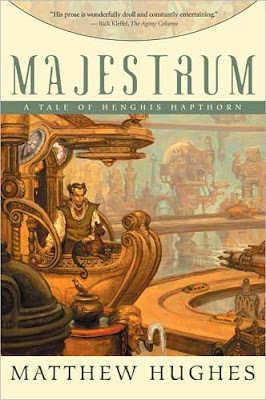 So, for that I’m extremely grateful, but you should know that I’m not reviewing this book just because Matt’s a nice guy ;) He’s also a damn fine writer and if I had known just how good “Majestrum” was going to be, I would have bought the book the very day it was out! Because there are so many reasons why I loved “Majestrum” I’m not sure where to begin, but since the novel is designated as A Tale of Henghis Hapthorn and is the first volume in an ongoing series from Mr. Hughes, I figured I would start by addressing the question, “Who is Henghis Hapthorn?” The witty reply would be that he’s “one of Old Earth’s foremost freelance discriminators”, but on a more serious note, Henghis Hapthorn is a detective modeled after the world’s most famous detective Sherlock Homes, and first appeared in six short stories that ran in the Fantasy & Science Fiction Magazine which are currently collected in Matt’s “The Gist Hunter and Other Stories” (2005). As a huge Sherlock Holmes fan, you can definitely see the resemblance between the two characters—their brilliant intellects, a somewhat bloated ego because of that intelligence, their cynical sense of humor, a flair for the theatrical, and how they both like to hold back answers until the mystery is completely solved…for Henghis, this is usually denoted by his signature phrase “It would be premature to say.” Furthermore, Matt’s writing style reminded me a bit of Sir Arthur Conan Doyle’s more ‘old-fashioned’ prose, albeit with greater wittiness and accessibility, though the biggest comparison I keep hearing is to Jack Vance. Since I haven’t read anything by Mr. Vance, I can’t comment, but apparently the setting is also influenced by Vance’s Dying Earth series, which sounds like something I would be interested in. I do like your Spotlight a lot :D Very useful to find cool books, and this looks I definitely missed a good book! You will be doing a top 20 of best books of 2007 in the next couple of weeks right? I'm very curious to see how you rank your favorites. I have a pretty good idea what you liked this year, but not ranked and compared to one another. The end of the year lists are pretty popular. As for a reason why Hughes wasn't picked up by one of the major publishers, possibly because of his past with small-time publishers, possibly because the book is rather short, or possibly because they didn't think it good enough? After all you really liked Sword-Edged Blonde as well and that was a Night Shade release as well. And also a short one. So you in a few weeks. Merry Christmas and Happy New Year to you too!